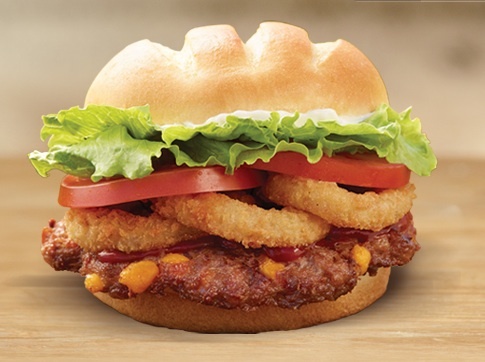 Burger King has been moving through new burgers and sandwiches at a fast clip this year. This is good, for me, in that it gives me more to write about. It’s also become something of a double-edged sword, as I haven’t been able to review everything I’ve wanted to. Their Chicken Philly sandwich in particular is one I’m sad to have missed. It’s also something I need to make sure to stay on top of, to maximize the usefulness of these reviews. So without further ado, here’s the Bacon Cheddar Stuffed Burger! I stole this promotional image off of Huffington Post, which makes me happy. This is actually Burger King’s second attempt at a stuffed hamburger patty. Like the Stuffed Steakhouse XT, the patty has chopped bits of ingredients mixed in, as opposed to a central pocket of cheese or something. This patty includes bacon bits and nuggets of cheddar cheese. It’s not terrible, per se, but there’s not quite enough of a flavor from the cooked-in ingredients to make it worthwhile. I don’t really think this is Burger King’s fault. The best stuffed burgers I’ve ever had have either been home-cooked or made to order at a steakhouse or burger joint. It’s a conceit that doesn’t translate well to machine-pressed patties, and Burger King isn’t really equipped to cook any other way. 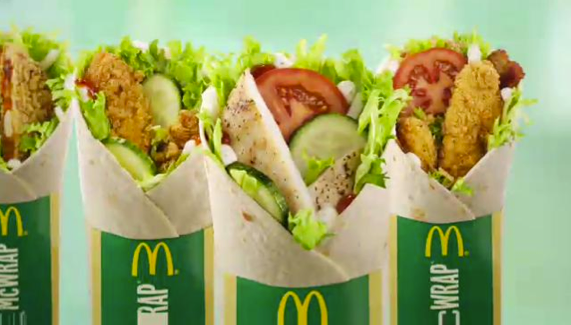 The rest of it (lettuce, tomatoes, onion rings, ketchup and mayo) is all fine, but nothing special. Being as it’s Burger King, the Bacon Cheddar Stuffed Burger runs $7-8 in a combo. While it’s not inedible, the execution doesn’t nearly live up to the concept. I’d avoid this one. There are plenty of other interesting options at BK right now, including a turkey burger and veggie burger, and I can’t imagine they’re going to slow down over there this summer. Save your money and try next month’s special. Arby’s isn’t the first chain to partner up with King’s Hawaiian, a small baking company known for their thick, sweet Hawaiian rolls. KFC pulled a similar trick a few years ago with the Doublicious, which itself was (my theory) a way to salvage the good parts of the shock value-based Double Down. I’ve been a fan of King’s Hawaiian even longer than that, ever since a friend and roommate brought a batch of rolls back from home after Christmas one year. When I saw that Arby’s added it to the menu, I figured it’d be right up my alley. Did you guys see The Descendants? I liked it. I mean, not as much as Up In The Air, but it was still pretty good. And it was, for the most part. The biggest issue I had with it couldn’t really be helped, which was that roast beef wouldn’t be my first choice as a meat pairing with this type of bread. I usually make ham sandwiches with it, and it went slightly better with chicken and bacon. Still, Arby’s roast beef is some of the best you can get around, and it certainly didn’t taste bad. The sandwich also includes Swiss cheese, a Dijon sauce, and pickles, which was kind of a new and interesting addition for an Arby’s sandwich. It was also much more filling than I expected, owning in part to the thicker, fuller bun, as well as the larger portion of roast beef. The King’s Hawaiian Roast Beef and Swiss runs for around $6 in a combo. It’s a pretty great deal, given that it’s tasty, filling, and different from most other offerings. 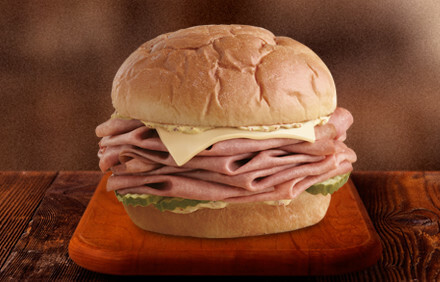 Still, if you can’t afford all that, Arby’s also has a basic roast beef on King’s Hawaiian. I’d highly recommend trying this sandwich while it’s still around. Everyone should learn the truth that is King’s Hawaiian, and this is a relatively low-risk introduction.